My research examines the relationship between visual art and transitional justice – how this relationship contributes to, and affects, ideas of justice. Specifically, I seek to understand the nature, extent and significance of this relationship in the context of ‘post-apartheid’ South Africa. The research takes the form of an in-depth case study of contemporary South African visual art across international, national and local levels. 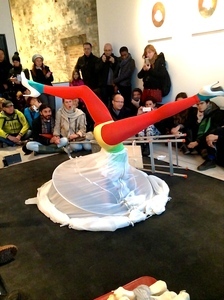 This photograph shows Neliswe Xaba’s performance of ‘The Venus in Venice’ which was part of the South African Pavilion at the 55th International Art Biennale in Venice, Italy. The performance examined the life of Sara Baartman, also known in the 19th Century as the ‘Hottentot Venus’. Imagining Baartman visiting Venice in the present-day, the performance took the audience on an emotional journey which raised questions about the politics, practices and justice of display.